This is the beautiful DSP called Paisley Petals, it is so pretty it is hard to cut, you girls know what I mean. 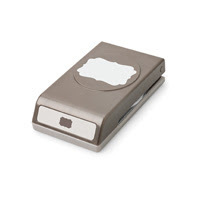 It coordinates with the new frames stamp set and our label punch, you can see below. If you want a larger view of the flyer just click on it. I have put a few samples on my blog lately to show you how fun and pretty it is. Now that is April 1st, I can show what I have been using. Today I had the pleasure of cooking brunch for my friends/customers. I told them it felt like Christmas because this is the brunch menu I cook for my family on Christmas morning! We all had a great time together, the ticket to this brunch was to bring a $100 or more order plus they got at least 2 SAB sets and there were prizes from $75-$20 plus hostess sets! Everyone was a winner. Below was our menu. I will have a luncheon using the same rules in July when the new catalog comes out and everyone wants to order their new "stuff"! Make sure you are on my newsletter mailing list so you will know when to get your name in the hat. Table Setting~ For my table setting that came about in a crazy way, one night this week my husband was cooking spaghetti for dinner so when I was doing dishes I found tomato sauce cans in the trash and thought what could I do with those. I cleaned them up and spray painted them. LOVE spray paint, it makes wonderful trash to treasure items. I popped some violas in them and used them for their little thank you gifts and table decorations. 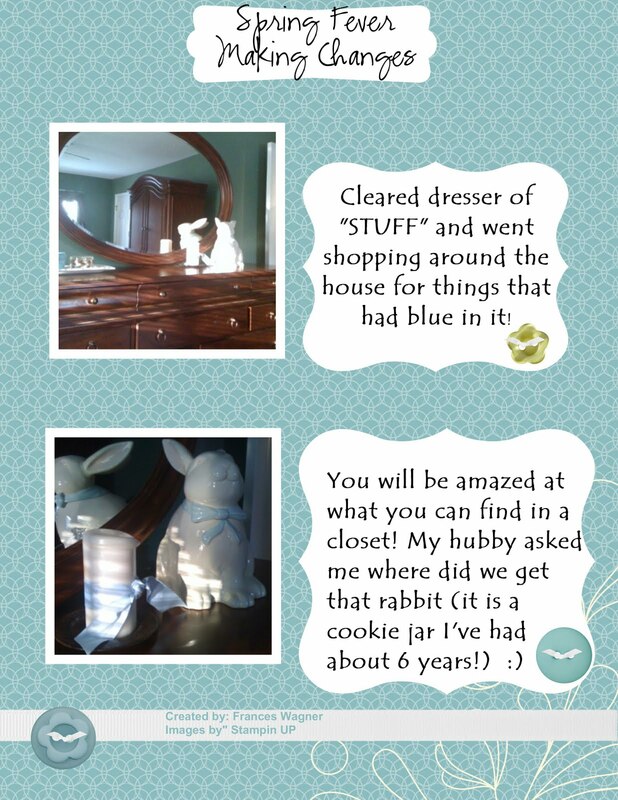 Do you notice that Bunny cookie jar I had on my dresser last week, well I thought that would be a great centerpiece. I also had different stamped pieces to show the girls that they can bring their stamping into their home decor. Napkin Ring/book mark ~ I was telling the girls the supplies I made the flower book mark with were all free, I had ribbon from the 2010 SAB mini and the Ice Cream Parlor Designer Series Paper (DSP) and free Ice Cream Parlor Buttons! Strength and Hope~ this is the card the girls made today, we used this new set from the Summer Mini. Another reason you will want to order this in May is because Stampin UP will donate $2.00 for each Strength and Hope stamp set they sell to the The Breast Cancer Research Foundation. I want to give credit to Monica Davis who had this card on her blog and I loved how hers looked and the girls loved their cards today. In May you will also be able to order the MDS verson of this set along with the DSP and embellishments. I will be demonstrating this set starting in May. Petal Cone Bunny~ I love this little bunny, I demonstrated how to make it today. Jill Olsen, in my upline, sent us a video this week on how to make it. It is adorable. Thank you Jill for sharing. Spring Banner~ I wanted something springy to put in my foyer and it turned out to large for it so I will have to use another method and smaller letters so stay tuned to see what I come up with. 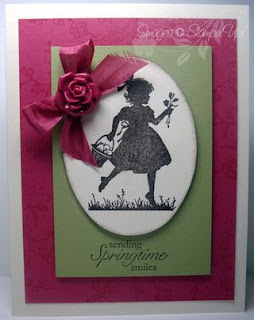 Not only have I got Spring Fever in my stamping, ie. flowers, birds etc but I also caught that bug in my home decor (which is my second favorite thing to do.) I was tired of my old dark colors in our bedroom so a couple of weeks ago I started working in it. I love decorating on a budget and see what I already have that I can use to make my home fun and pretty with little money invested, at the same time. Below I have added pictures in My Digital Studio to share with you what I did in my bedroom. I am trying to see which I like best white writing, black writing or blue writing.... what do you think? 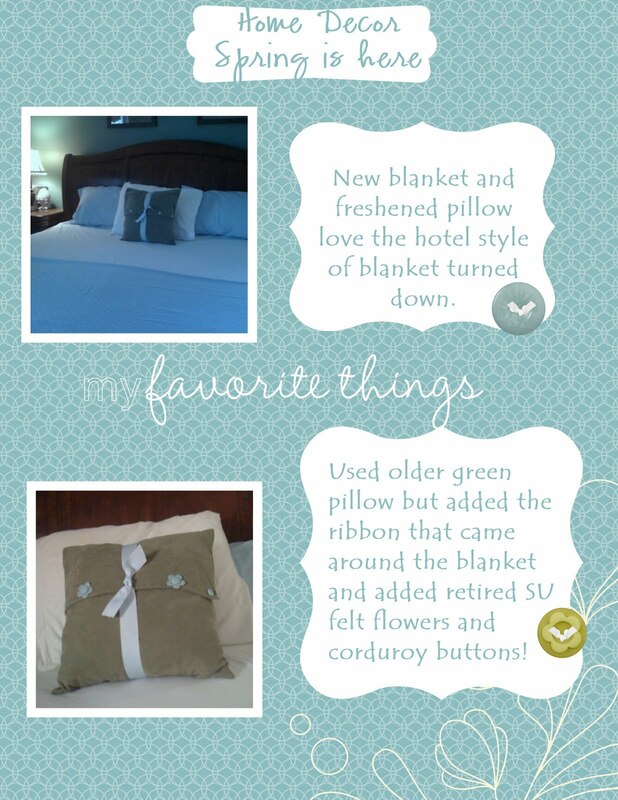 Next I will work on my guest room so stay tuned! Today is an anxious day for me I am waiting to go to the dentist to have a tooth pulled and I am not a fan of the dentist. :( So while I am waiting I started playing with my new stamp set Four Frames and the beautiful designer paper that will be in the new catalog in July. I had a piece of scrap that I had left over from another try at a different card and decided to see what I could do with it. 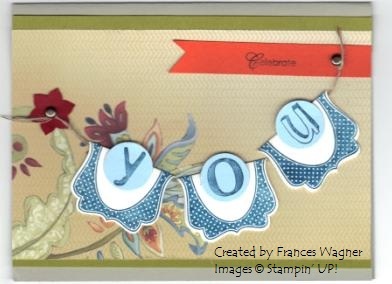 This card is similiar to the sample that Stampin UP has on their demo website but I tweeked it a bit. By the way one of the cool things about being a SU demo is you get to order products before they come out and make samples to show my friends and get them as excited about them as I am. The other thing (who am I kidding that are a gazillion things I love about Stampin Up or I would not have been a demonstrator for almost 12 years! )anyway is that they always give us great samples to copy so we don't have to create everything from scratch. 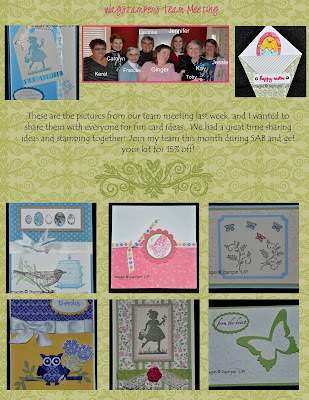 One of the things I have my stamp clubs do once in a while is to copy something out of the Stampin Up catalog. (afterall they hire artist to create these samples and I love them) I will add the products used later. If you need to see the picture larger just click on it and sometimes you need to click twice. Thanks for stopping by! When I started designing with this piece of the Paisley Petals Designer paper, I didn't want to cut it, it is so pretty! DO YOU WANT THIS STAMP SET AND DESIGNER PAPER????? 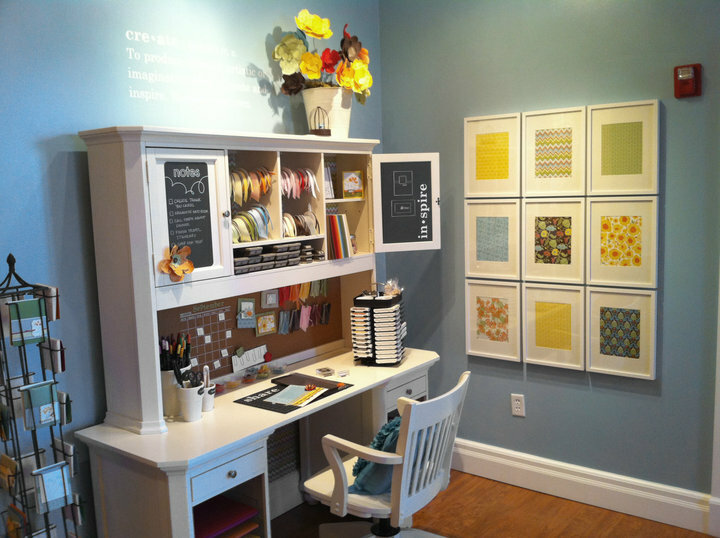 This Stamp set and Designer Paper are actually a sneak peek of products from the upcoming 2011 - 2012 Idea Book and Catalog. AND YOU CAN GET THEM TOO. 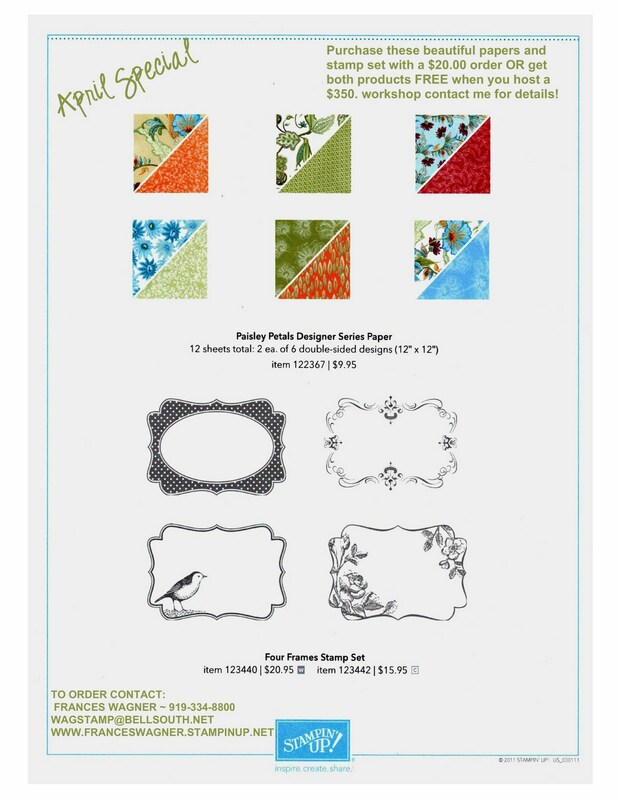 SPEND $20 on any Stampin UP products and become eligible to purchase both the Frames Set and Paisley Petals Designer Series Paper. HOST a $350. workshop and get the Four Frames Set and Paisley Petals Designer Series Paper for FREE. Contact me soon to book your April workshop I want you to earn these awesome gifts, along with all the other great Hostess Stamp Sets and gifts we shower on our Hostess's. The Stampin' Up! 2011 Occassions Mini Catalog has arrived and it compliments the current Idea Book and Catalog wonderfully! There are many new and exciting products in the catalogs for you to use in your card making, scrapbooking and craft projects and here is your chance to win some FREE products! I need 10 participants to show these exciting catalogs and the Sale-A-Bration brochure to friends, family and co-workers and each collect $100 in orders (before shipping/handling & tax). You can order it by yourself or collect any combination of orders totaling $100 to be included in the prize drawings, where everyone will win a prize. Double your chances of winning; an extra prize slip will be awarded to the individual who collects the most in sales! (over $100). This drawing is based on 10 people submitting orders totaling $100 or more. As you look through the Idea Book & Catalog, Occassions Mini Catalog and the Sale-A-Bration brochure, you will realize how easy it will be to collect $100 in orders from you and your friends. Plus anyone who places a $50 order during this promotion will receive one Sale-A-Bration product for FREE! Collect two $50 orders and you're done! You will want to jump on this opportunity to get your FREE products. Orders are due by March 26, 2011. Email or call no later than March 12th , if you would like to participate in the $100 club. On March 26th, for those who want to attend, there will be a short, special event just for those who have signed up to participate in the $100 Club. It will start at 9:30am with a delicious brunch. There will be three stamping projects, and then the drawing for the prizes will be held. If you are unable to come, just have your $100+ orders to me by 9:30am and you will notified of the prize you win. 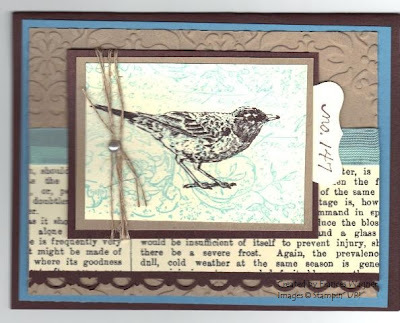 Card Kit Order Deadline is March 15th. You will receive your kits at the end of the month. Special Offer for March! Purchase the Card Kit and receive the featured stamp set “Easter Blossoms” and the Featured Accessory “Vintage Flower Adornments” at 20% off! 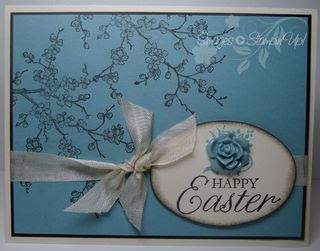 * Easter Blossoms Stamp Set: Wood - ($25.95) $20.76 Clear - ($1895) $15.16 with the purchase of the Card Kit. * Vintage Flower Adornments ($5.95) $4.76 with the purchase of the Card Kit. 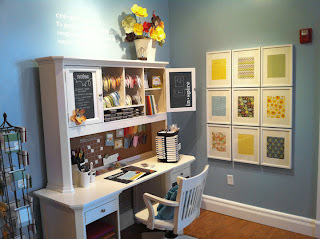 In a previous post I said that I would find the picture of the stamp area vignette that is at the home office that is my inspiration! Yes I am far from this cute picture but I can use parts of it and work from there. Enjoy the inspiration! With my Stamp Fire Girls (stamp club) order today I made my goal and over. Thanks to all my customers past and present. I love my job! To love what we do and share what we love, as we help others enjoy creativity and worthwhile accomplishments... in this we make a difference! (this is the Statement of the Heart from Stampin UP and it is so true. Who would have thought almost 12 years ago when I became a Stampin UP demonstrator that I would ever get past just making my quota each quarter or just to get my own discount. I know I did not look that far. 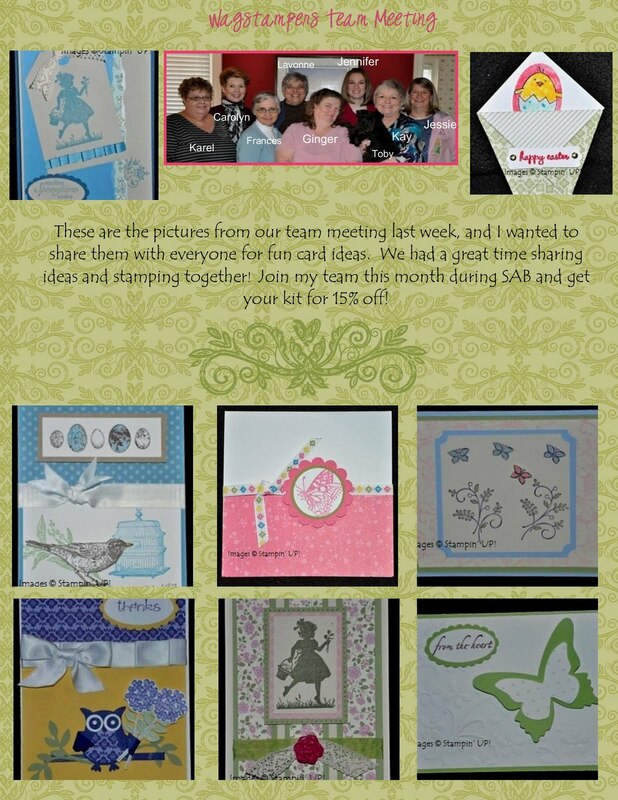 I am proud to be a Stampin UP demonstrator and happy to show others how to find that creativity in themselves. If you ever thought you would like to become a SU demonstrator or if you would like extra money for fun stuff ie vacations, children's camp in the summer or if you need extra money these days to pay the mortgage or car payment to help out your family needs then I highly recommend becoming a Stampin UP demonstrator. Contact me if you are interested and I will be glad to help you out. I would love to have you on my team. Plus there is a 15% discount to join for the rest of March. 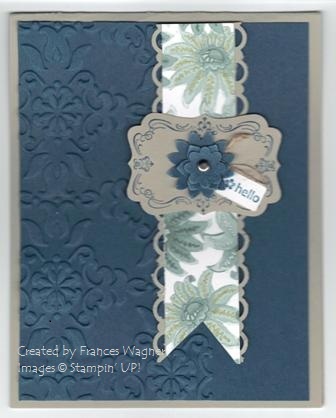 First the exciting news, this August I will have been a Stampin' Up!demonstrator for 12 years!!! Can you believe it? It has gone by so fast, well my exciting news is in my career as a demonstrator I have "ALMOST" reached one of my goals and that is..............drum roll.......... I am $206.64 away from selling $100,000.00 during my career..... wow I didn't realize I was so close. I thought I would reach it during SAB this year but was not sure. So after this weekend I may be there. 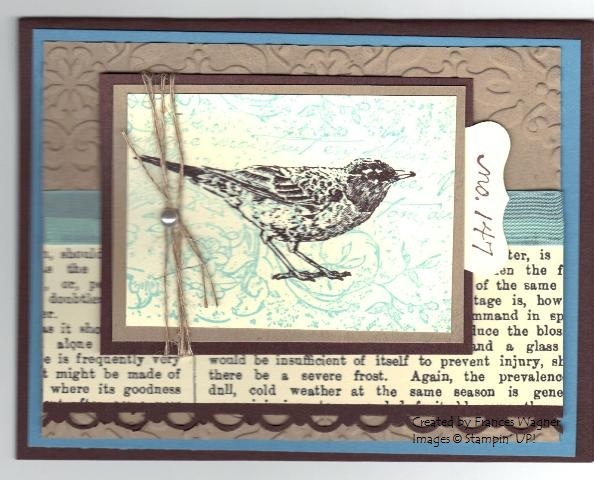 Below is the card we made at Shirley's workshop last night. Those girls had so much fun. They are mostly girls from my Magnificent 6 stamp club and a few more friends. They work in tandem and help each other out and laugh and have a fantastic time each time we get together. 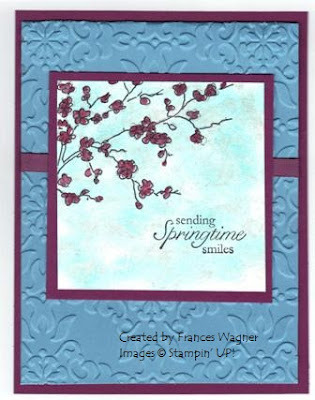 We used the new stamp set Build a Blossom #121994 in the Occasions Mini catalog page 12 along with the Blossom Petals Punch that coordinates with the stamp set. I added the Baja Breeze Glass Glitter #121883 on page 18 for the center of the flower. So cute. Petal Cone- Big Shot die is one of the new items in the Occasions Mini catalog, page 15 #121810 there are so many cute things you can do with it. Here is a sample that I came up with that I love, I will be working with this die to make some spring banners this weekend and will post them for you. I have to give a shout out to Meg Loven for inspiration on this one. It was my hostess gift for Shirley last night and I put a little candy treat wrapped in dsp paper for her and they all loved it. Thanks for stopping by contact me is you have any questions.